Abtex Corp., Dresden, NY, has designed and built its largest and most technologically advanced Tri-Ten deburring system, optimized to deburr high-volume fineblanked parts. The machine can be bulk fed (operator or robot) or fed directly by an upstream press. An in-feed conveyor passes parts under a vision system before they enter the deburring stations. The vision system, programmed to stop the machine if parts are overlapped, stacked or otherwise improperly loaded, communicates with the upstream press, centralized coolant system and downstream conveyors to ensure safe, efficient and effective part processing. 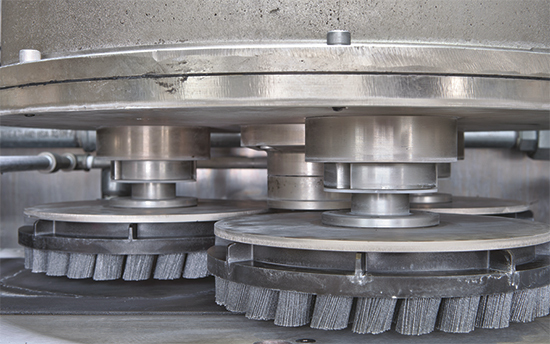 The machine features three planetary heads—three custom-designed 254-mm flap discs on the first head remove the primary stamping burr; six 254-mm, application-specific abrasive filament brushes on the second and third heads eliminate secondary burrs and provide the specified edge radius. Coolant is liberally applied during the deburring operation to ensure part cleanliness and extend media life. After deburring, a gap conveyor transfers parts to a rinse station; demagnetization and blow-off bays efficiently remove any residual debris or particulate.